1932 began with Lugosi as a contract star for Universal, and ended with him declaring bankruptcy. His interviews span a wide range as well. In January he shares with John Sinclair as he ever would about his wife in Hungary. Another interviewer sees him with his dogs, and another meets him at The Brown Derby. Most of the verbiage is studio publicity fodder, telling much more about the writers’ fantasies than about Lugosi. Has Bela Lugosi Inherited the Mantle of Lon Chaney? Bela Lugosi, the Hungarian actor, has a home of modest and simple exterior on a quiet street in Hollywood. But the real character of the actor’s home lies on the other side of the heavy paneled door. A long living room with walls that rise 20 feet to the ceiling. A concert grand piano close beside the huge studio window that looks up to the hills of Hollywood. Fine paintings. Rare books well read. Monterey furniture with deep leather cushions. A sense of vast space. Of himself, Lugosi says he does not want people to see his clothes first and himself afterward. He thinks the personality should outshine all the details of dress. That is the reason you will find him in ready-made suits for every day. It is only on the occasion of studio calls, social festivities, and very special days that his valet can persuade him to get into his exquisitely tailored clothes. 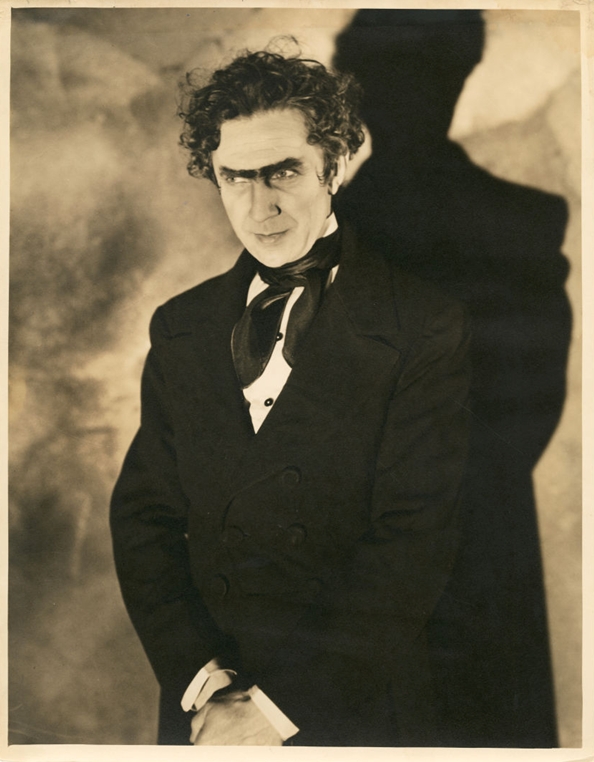 Three years on the stage in the title role of Dracula, followed by the same role in the film version, and other picture characterizations of eerie nature, apparently have permanently identified the name of Bela Lugosi with the weird and unusual. Fan letters come to him from all over the world and they are all written in the same vein. They from people who sense in him the supernatural, and who wish to ask him questions about life and themselves which he cannot possibly answer. They come from movie fans who have heard strange tales about his childhood in the Hungarian town of Lugos, and believe it is his early association with vampires and medieval ghosts that enables him to play his vivid characterizations. A letter on the latter type always makes Bela smile. Born in the country town that had been named for one of his ancestors when he founded it as a hamlet. Bela’s childhood was the usual husky, absorbing life of the country boy. He had his donkey to ride over the town and into the country. The fact that his family, well fixed financially, were already planning a distinguished career for him as a statesman or a banker did not trouble him during this happy period of his life. A childhood memory that stands out sharply in Lugosi’s mind concerns the circumstances of earning his first money—a sum equal to about 10¢. “A girl in the village park offered me the money if I would hold her dog while she sat on a bench and kissed her sweetheart. Bela says he remembers that he certainly earned the money, because the kisses became quite lengthy affairs, and the dog pulled hard on his leash, and he himself was only 7 and was soon tired out. Other letters that come to Lugosi remark about his extremely long and fascinating hands; and his eyes which are like no eyes of living man. During his early teen years Bela was deeply attracted to the theatre. He had read Romeo & Juliet so many times he knew the whole thing by heart. When the leading man of the traveling show which was to present the Shakespearean play in the Hungarian town took sick, Bela went to the manager and asked to be put on as a substitute. Lugosi made good in this first venture and the experience forever spoiled for him the old proverb about the prophet in his home town. The one big love of Lugosi’s life came to him in his native country. She was 16, the daughter of a very wealthy couple who held high social hopes for the girl. Bela was past 30. His income as an actor, even though he was a very popular young leading man, was considered small by his prospective in-laws. In addition, Bela and the girl’s father belonged to opposing political parties. But it was a love match and the girl and the man over-rode all objections and, were married. What happened brought lines of unhappiness to Lugosi’s face which two subsequent marriages could not obliterate. Afterward, Lugosi learned that his letters never reached the girl-wife. Her parents had reasons for having it so, When Bela did finally get in touch with the girl, he found she had married a man of her parents’ choice the day after her divorce from him. Two other marriages of Lugosi’s have ended in divorce. He does not say he will not marry again; the person who makes statements of finality in such matters shows lack of wisdom, he says. He holds no bitterness. An example of his attitude toward events in his life is shown in the fact that he calls upon an ex-wife who lives in San Francisco whenever he is in the Bay City. When he appeared in a play there the two were seen constantly in each other’s company. A few weeks ago the Hungarian passed his citizenship examinations and is now an American citizen. Bela of Lugos has become Lugosi of America—with knowledge of American history and laws that would quite surprise the average native. If, after seeing a monk, a nun or a black cat you spit quickly, you can’t help but live in the shadow of good luck. Take Lugosi’s word for it. This is the contention of Bela Lugosi, who is generally conceded to stand in a class by himself as a delineator of terrible characters on the screen. Before his debut on the screen, Lugosi starred for three years in the stage production ofDracula, and it was then he discovered that feminine theatergoers were the most avid pursuers of gruesome thrills. Fiendish villain on the screen become charming friends when shorn of their professional scowls. For instance, there’s that fellow, Bela Lugosi. We follow winding roads around the hills of Hollywood to reach Castle Dracula. And when we have gone as high as anyone would want to go we make a right turn around a bend and a drop of several hundred feet greets our dizzy eyes. After a sharp left turn away from this disconcerting view, Castle Dracula rears up in front. As I parked my car one could have cut the atmosphere with a knife, so deadly quiet was everything. But I was sent to beard the VAMPIRE in his den and meant to go through with it. Just as I gave the knocker a fling, a long eerie wail reached my ears. It was prolonged—weird, coming to a final crescendo with a demonical howl. I knew that Dracula assuming the form of a wolf was on the other side of the door waiting for me—a new and choice morsel for his blood lust. Before I could retreat the door opened and he was upon me. His fangs reached for my throat. As pretty a huskie dog as I have ever seen nearly swept me off my feet with his waggin tail, as he turned to face his master, Bela Lugosi, the original Dracula. Lugosi’s home reflects the fine mind of this great Hungarian actor. Every piece of furniture has been made under his own eye and from his own design. His living room is illuminated by windows reaching from floor to ceiling and reveals a gorgeous view on either side of hills and valleys undulating with nothing to obstruct the perfect view. The walls are lined with paintings—the works of well known foreign artists. A concert grand piano dominates a corner. Bela Lugosi, inhuman villain of the screen, has none of that ghoulish menace in real life. He looks the cultivated scholar and thinker he is. He lives in his beautiful hill home happily reflecting on the sheer joy of living. His dogs and his pipe—his fine collection of masters, books and paintings—his music occupy his off-screen moments. His disposition is kindly—yet he is one of our best heavies. If his Dracula is fear compelling to you, his Murders in the Rue Morgue will bring you a session of shivers. Lugosi of the screen is a fiend. The following interview is transcribed from the Talking Pictures Epics, Inc. seven-minute short film Intimate Interviews, in which Dorothy West conducted staged interview with Bela Lugosi in the garden of his house. Lugosi: Yes, we completed the picture yesterday. West: Do you start another immediately? Lugosi: I think the next week. West: You’re Hungarian, aren’t you Mr. Lugosi? Lugosi: Yes, I am. What I mean, I am Hungarian by birth. I’m an American now. West: Why did you leave Hungary? Lugosi: Political reasons. After the war I participated in the revolution; and later, I found myself on the wrong side. West: Oh! That’s very unfortunate. What are you studying now? West: Okay. Is that your pool? Lugosi: Yes, and I can’t change the water because all the fish will die. I clean it myself every morning. West: Oh, you do. It’s rather warm today. But, you did become a citizen, did you not? Lugosi: Some time ago, and I am very glad and happy about it. I can stay here for good. It is very nice to live in a country where people know how to mind their own business. There’s something else. It’s wonderful how, how the American people display their sportsmanship. West: Mr. Lugosi, did you play any mystery parts in Europe? Lugosi: No, I didn’t, by accident I didn’t. West: What type of roles did you play? Lugosi: Oh, different type of roles. Character, dramatic, romantic. All kinds. West: Have you ever been interested in anything outside your profession? Lugosi: Oh, yes, very much. I like modern sculpture. In my spare time, I like to put my surplus energy into molding the clay. West: Do you believe in vampires? Lugosi: Yes, and three of them, I married. West: What was your first mystery play? West: Well, did the role attract you? Lugosi: Very much. It haunted me. I often dreamed of the dead. In the morning when I woke up I was tired, restless. Did you see the play? West: No, I didn’t. I’m awfully sorry. But, what kind of makeup did you use? Lugosi: Oh, I can show it to you on the picture that I promised you. West: Oh, I’d love to see it. West: Oooo, how frightfully weird. Lugosi: It isn’t so much the makeup, it’s rather expression. West: I’m afraid I’ll dream about this myself tonight. West: Were you satisfied with your work in pictures? Lugosi: No. When an actor gets satisfied with his work, he’s done, he’s through. You see in the National Theatre of Hungary in Budapest, all the great character parts are played by four or five different players. Each competes with the others. Each plays the part in accordance with their own conceptions. And the audience is just as much interested in the actor’s conception of the role than it’s interested in the play itself. West: Well, would you like to play in anymore mystery parts in the future? Lugosi: Yes, why not? I think they are very interesting. But I would rather have it combined with some romance. It would have much greater appeal to the audience, and in the box office of the producers would gain more. Romance is very important. West: Speaking of romance, do you ever go to any Hollywood parties? Lugosi: No, life is too short for that. I wouldn’t waste my time. There are so many interesting, wonderful things in the world that a man could achieve and experience. Besides, I don’t even know how to play that, what do you call it, a ukulele. West: But you have so many friends, Mr. Lugosi. Lugosi: Well, I guess that I am pretty much of a lone wolf. I don’t say that I don’t like people at all, but to tell you the truth I only like them if I have a chance to see into their hearts and their minds. If I find there is something, something worthwhile, some human kindness, some sympathy. Lugosi: Pardon me. (looks to the distance) I’m coming! West: Why, I didn’t hear anyone calling. Transcriber’s Note: The below is an extract syndicated news column that appeared in many newspapers on or about June 29, 1932. Down at the Brown Derby the other noon, whom should I meet but Bela (Scares Little Children) Lugosi…and Bela was wearing a bat ring…green gold, it was, with two flaming rubies for eyes…but something to look at. Was a gigantic hoax perpetrated on the author by “Dracula” Lugosi and “Frankenstein” Karloff,” aided and abetted by the photographer. Boris Karloff was first to arrive—and, fantastically enough in evening clothes, worn under a rain flecked overcoat which he tossed off with a mischievous, almost boyish fling. The tall actors in evening clothes sat on the davenport. In the obscure gloom we scaraclet could discern their figures. But soon we were to hear a mournful voice, Lugosi’s. “Boris,” he began in a gloating sonority,” what would you say if this set, this stage, tis studio, suddenly vanished, and you found that in reality you and I were sitting at the bottom of a pit. Ha! That would be inconvenient for you, wouldn’t it? But of course I might provide some charming company—I might drag down into this pit an exquisite young woman. And I should indulge in a curious experiment that would cause your hair to turn white—and your stomach to turn inside out. Just as I reached it and noted fleetingly that the rain had stopped, and that my heart was pouding to the bursting-point, and that I was strongly weak and giddy, Jones and the two tall actors in evening clothes came through the door. Jones was rather sober and unconcerned, but Lugosi and Karloff were laughing heartily over something or other.